One way to stay involved with your LinkedIn network is to keep up to date on how your first-degree connections are using LinkedIn. To that end, the Network Activity section (now called LinkedIn Pulse) summarizes all the activity within your immediate LinkedIn network. Typically, your Network Activity section contains the most recent 25 items. 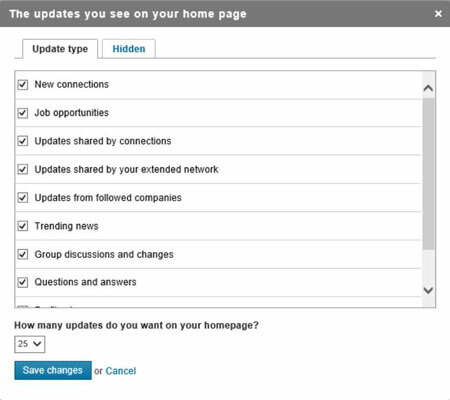 If you’re looking at the Network Activity section of your LinkedIn home page, you can click the All Updates link (these words are a link) to filter your items. You can pick a subcategory, such as Connections (to see who in your network has new connections), Shares (to see what your connections are sharing), Profiles (to see what profile updates your connections are making), Groups (to see group updates), Companies (to see updates from companies you’re following), Jobs (to see any updates or activities regarding your job search), or Your Updates (to see a list of the network updates). 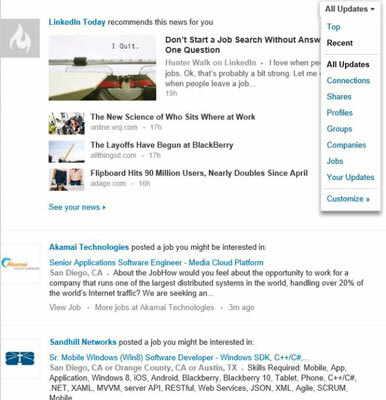 Hover your mouse over the All Updates link in the top-right corner of the LinkedIn Pulse section of your page, then click the Customize link. The Updates You See on Your Home Page pop-up window appears. By default, all the criteria shown on this page should be selected. To remove any criteria from the list, deselect the check box for that feature. You’re taken back to the Account & Settings page.